Play game using a loud or quiet voice. When a student is "out" he or she goes to a hand drum and plays along either loudly or quietly. Teacher plays hand drum either loudly or quietly. Students aurally identify and play the game as the teacher directed with the drum. Pretend the bee is buzzing through the air (speak high). Pretend the bee has landed on a flower (speak low). Lean a barred instrument upon a chair so the high end is facing up. One student may play the rhyme with high or low pitches while the rest of the class speaks. Point to bee icons that are close together (fast) or far apart (slow). * Note: This game is an addition and not listed in the source. 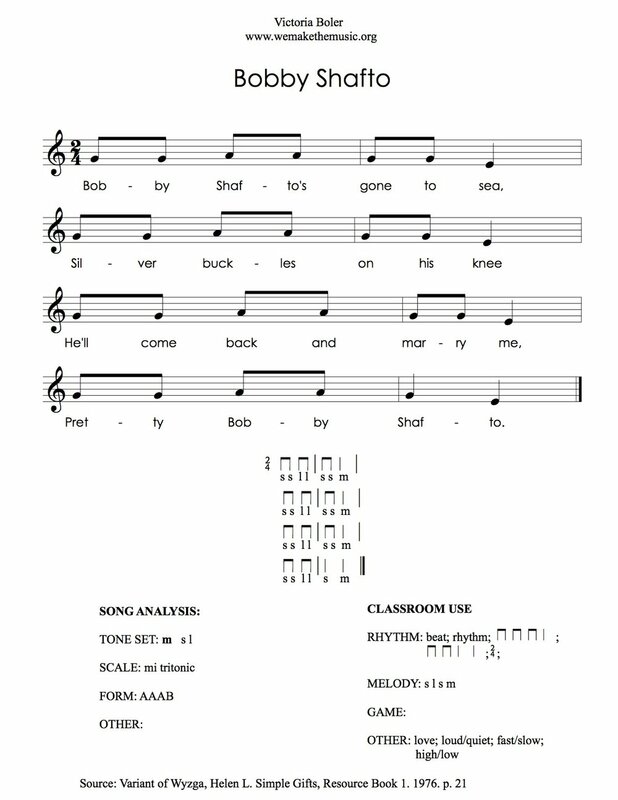 * Note: Some teachers sing "bonny Bobby Shafto" instead of "pretty Bobby Shafto". Use a loud voice when Bobby Shafto's ship is across the ocean. Use a quiet singing voice when his ship is close by. Students listen to T sing the song either loudly or quietly. Students identify whether Bobby Shafto is close or far away. Bobby Shafto's ship is floating on a high wave or low wave. Students sing while looking at visual representation. Bobby Shafto's ship is moving fast or slow across the ocean. Sing how his ship moves. Move around the room as the teacher sings the song fast or slow.